I recently finished a little project just for me. I often give away the things I make or create them for family use. This time, I made something that is for my use only and I designed it to suit me. It feels really good to do that sometimes. I wanted something special for storing my crochet hooks. I have a set of six Susan Bates Silvalume hooks, sizes F-K. I had been keeping them in the little vinyl pouch they came in when I bought them in 2002. It works okay but is starting to get worn out. I'm also planning to acquire other sizes of hooks now that I'm crocheting seriously and learning more. I began searching for ways to make myself a more durable storage system. And why not make it adorable at the same time? That's right, I knew you'd agree. There are so many different ways to make a hook case, and I considered crocheting one; a crocheted case for crochet hooks is very meta, isn't it? In the end I decided to sew it instead, because it seemed like it might be more durable if made from fabric. My inspiration for this case, which is actually more of a roll, came from a few places. One person who inspired me is Sandra, of the blog Cherry Heart. 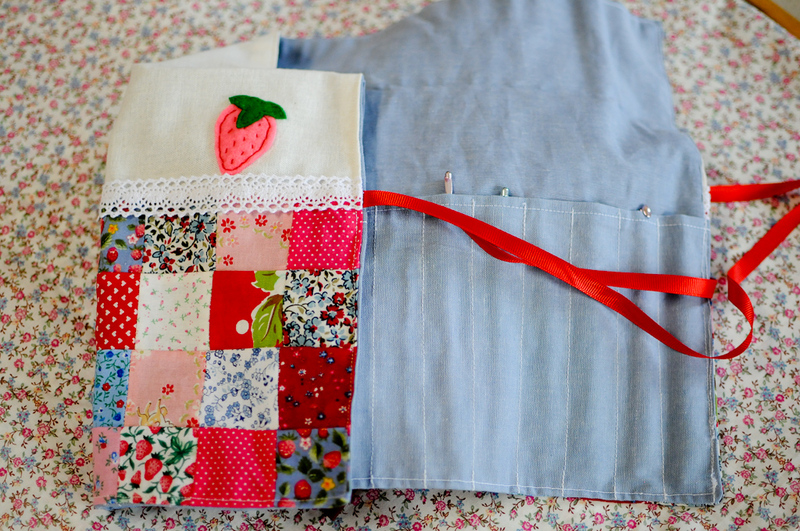 Sandra recently created a couple of really gorgeous patchwork hook cases and I took a lot of style cues from her. 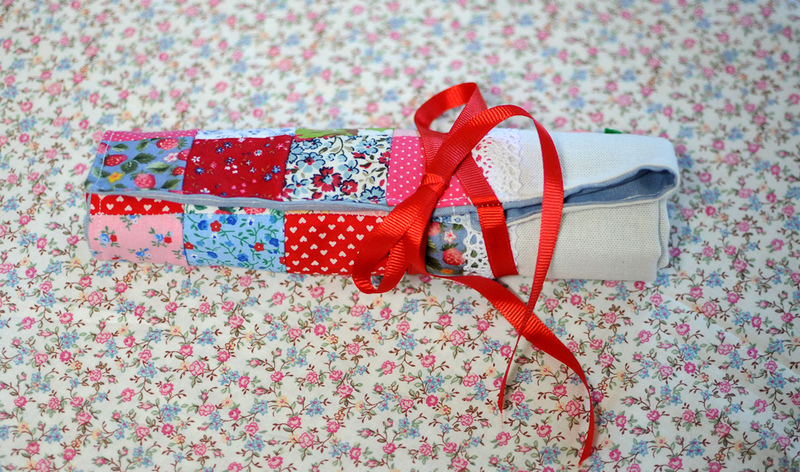 Christina, of the blog Christina Lowry Designs, has an excellent tutorial on her blog for making a crochet hook roll. Her tutorial offered many of the technical details I needed. I also drew inspiration from the Bear! Did you know that he sews? It's true. Most of what he sews is utilitarian, items he makes for shop or outdoor use. He sews by hand and sometimes with my sewing machine. He has lots of great design ideas too; he's a true renaissance man. Sidebar: he brought his own sewing kit into the marriage and he impressed me beyond measure by showing up for our very first date in a shirt onto which he had sewn a new button that afternoon; it was from a thrift store (another brownie point from me) and was a very nice shirt, just in need of one replacement button. Our love was written in the stars. 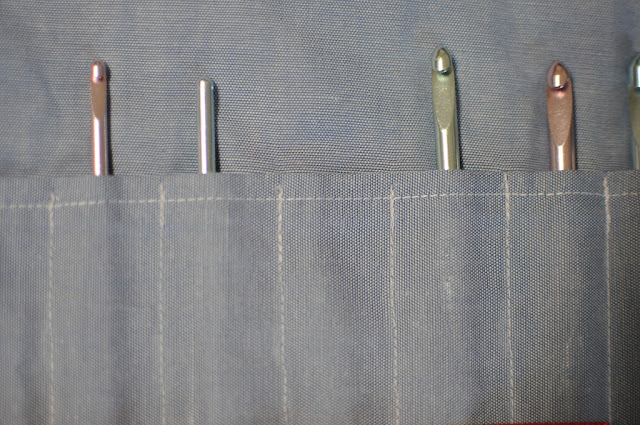 The Bear had made a very nice storage roll for his chisels a few years ago; he used heavy canvas material and added tie-strings recycled from an army-surplus bag. His chisel roll is so neat and compact, I knew it would be a good design for my hooks. This is the front of my hook roll. As you can see, it's very berry-ful. This roll is mine, all mine - and I made it with my favorite motif, strawberries, to reflect that. This part is definitely Sandra-inspired; she did hers with patchwork and appliqued cherries. I made felt strawberries to applique onto the white portion. These were fun to make. I created a little template with pencil and paper and used it to cut out berry and leaf shapes from sheets of felt. Then I hand-stitched them onto the linen. I finished the front of the roll with a strip of pretty white cotton lace stitched over the seam between the linen portion and the patchwork portion. I made my ties from narrow red grosgrain ribbon; they were stitched into the edge between the front piece and the backing. The backing is made from a scrap of blue pinpoint-oxford cloth; I used the same material for the hook pocket inside. I feel my pocket could use some improvement; it's about an inch too tall, making the pouches deeper than they ought to be. My hooks slide down to the bottom of the pouches. I could fix this by sewing a seam straight across but I think I'll leave it for now; it's not a big deal if the hooks slide down. If anything, it helps them stay inside the roll more securely. The top folds down over the hooks before the case is rolled up, to help them stay inside. I made a total of fifteen hook pouches (plenty of space for as many hooks as I might collect) and one larger one, at the left-hand side, which can hold a small pair of scissors or other implements. This was a great tip from Christina's tutorial. The whole thing rolls from right to left in a neat tube and the ribbons tie around it to keep it closed. 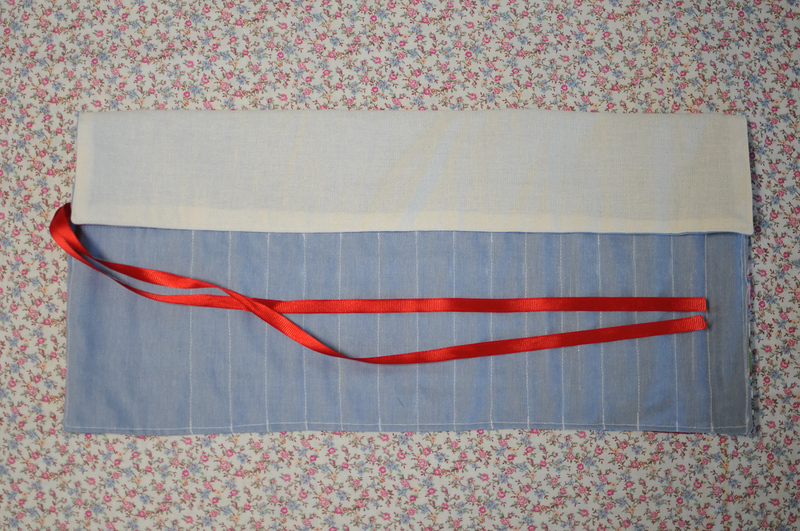 I purposely left the ribbons a bit too long so that they can still be tied when I have more items inside the roll. It's neat, sweet and just my style - homespun, a little bit country, a little bit faux-vintage. Strawberry-riffic! Those strawberries are adorable, I love this! I love the berries how cute! I absolutely adore this roll! It's beautiful Jennifer and your patchwork is so neat too, all your squares look perfectly in line! 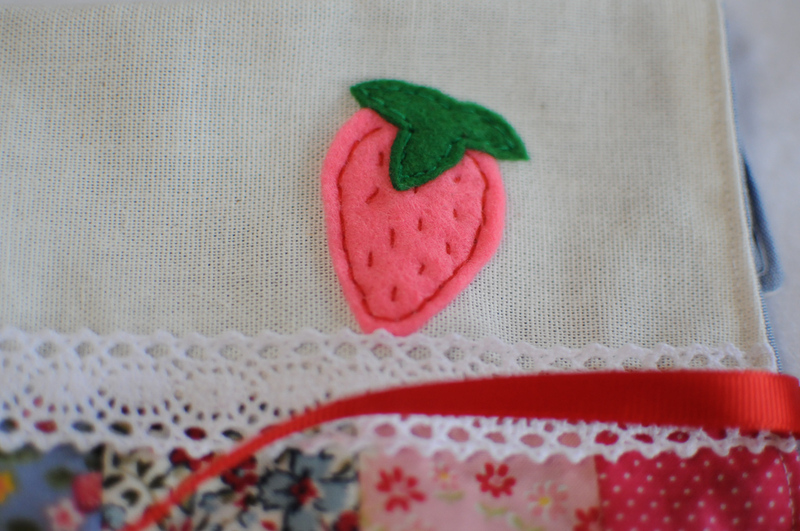 The embroidered strawberry applique just pushed me over the edge! Very cute. Oh Jennifer can't we persuade you to give it away - it's beautiful and I want one. Joking aside its adorable and will be lovely to keep your treasured hooks safe. I really like this hook roll, very clever, and such a nice way to do patchwork. Thank you so much for visiting my blog and your kind comments. What a great idea! My hooks are currently scattered in my drawer. I really need to "try" and make one of these.